As the temperatures are getting hot now we decided to ring in the evening rather than the morning when the temperatures are more bearable. We arrived at the marsh just after 15:00 hrs and set up two nets in the two prime locations. Bird activity was very low as the main migration period is now finished for the region, but the heat prevented us from setting more nets. I flushed a bird from the reeds into the net on the way out after having set the second net which turned out to be a Caspian Reed Warbler. 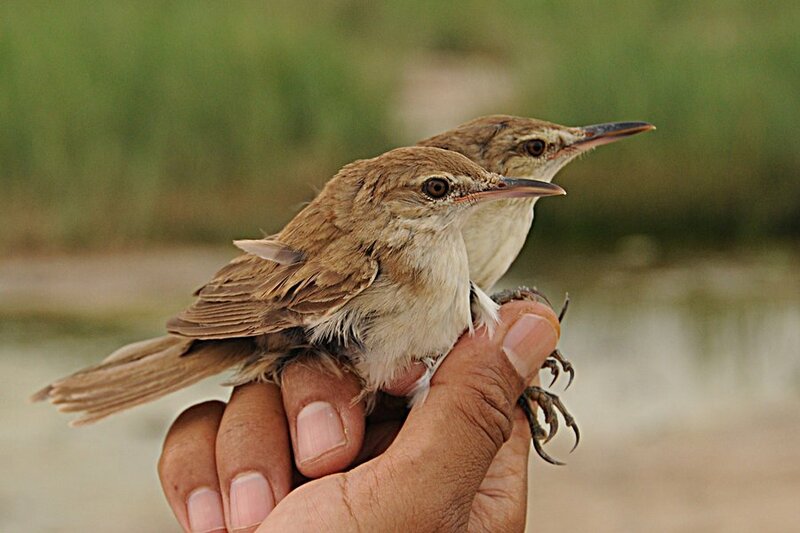 Brendan and I had quite a discussion on this bird and took all sorts of measurements to rule our Marsh Warbler and Blyth’s Reed Warbler. Whilst we were doing this Adbulla and Mubarak arrived to lend a hand. 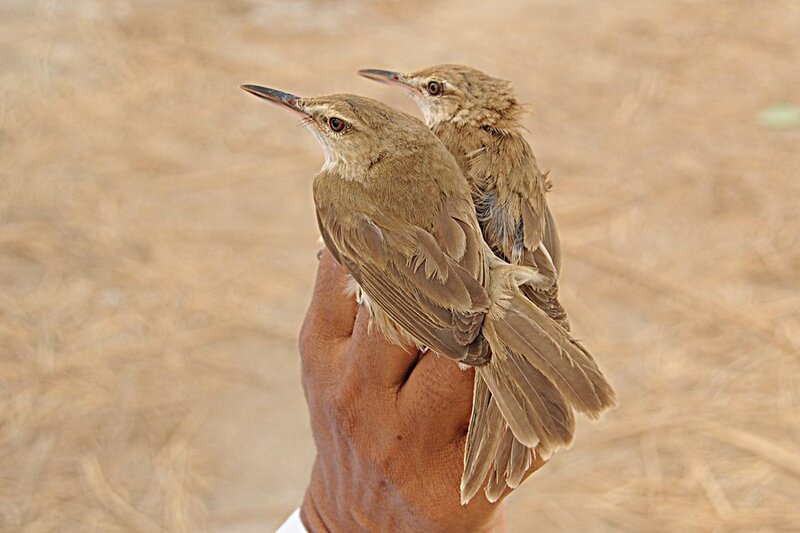 We caught thirteen birds in total, which was more than I had envisaged prior to arriving. 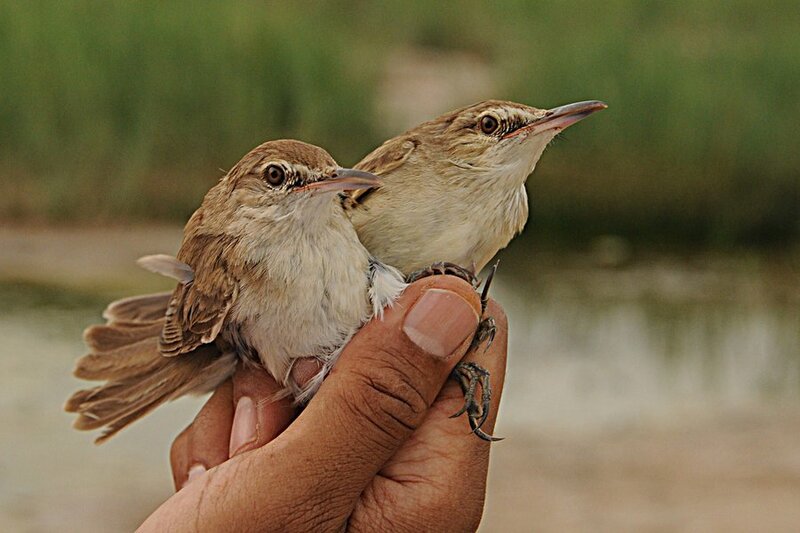 This included five Caspian Reed Warblers, two Clamorous Reed Warblers, three Common Moorhen, one Black-winged Stilt (chick), one House Sparrow and one Graceful Prinia. 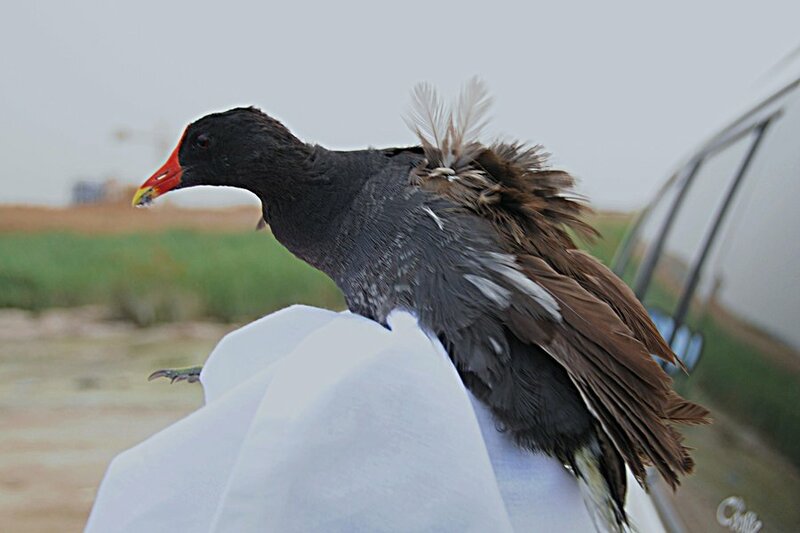 Abdulla ringed the Black-winged Stilt and one Common Moorhen as they were ringing ticks for him and I ringed the other birds. 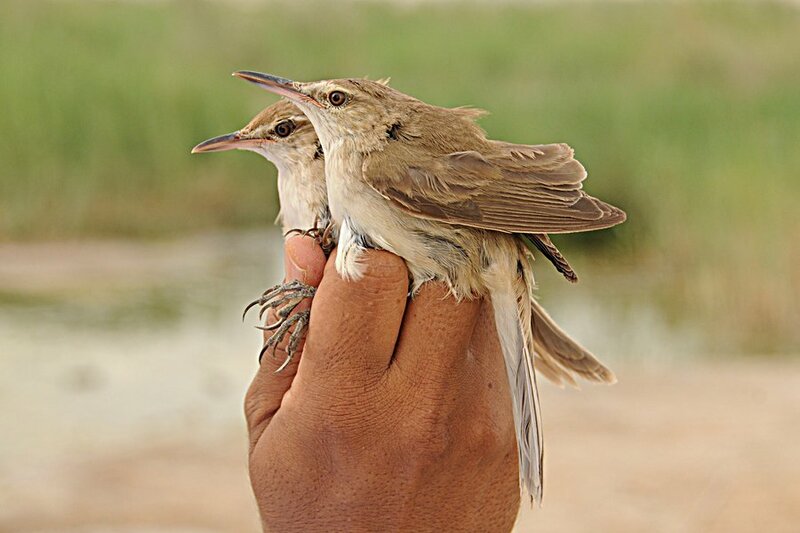 The main excitement was from one of the Clamorous Reed Warblers that was a re-trap of the bird ringed in Oman in 2008 (see previous post on this bird). The bird is a female and is starting to sit on her second clutch of eggs as she had a brood patch similar to when we caught her in early April. 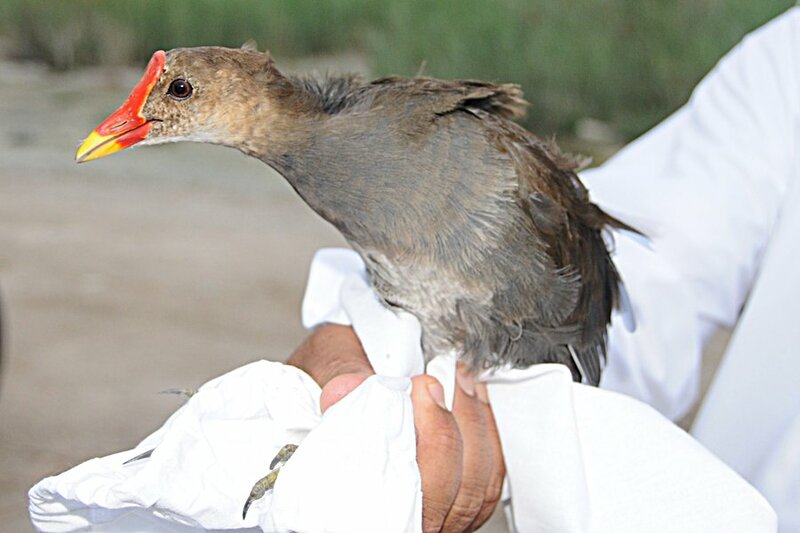 The adult Common Moorhens had very worn fight feathers and looked a bit worse for wear. WOW - like the warblers! What's with the long face....We have a little bit of SA with us, glorious HOT weather and a Cream Coloured Courser about an hour and a half away - saw it yesterday, what a stunner, an adult bird - i've waited 28 years to get this one back!